Please contact all the below listed distributors/manufacturers for Triphosgene and ask for prices, package standards and transport possibilities. Our registered distributors will help you to get all necessary information and product specifications. For over 17 years, Richman Chemical, Inc. (RCI) has been providing project management, custom manufacturing and sourcing services to the chemical and life sciences industries. RCI has an extensive chemical and pharmaceutical raw material and intermediate product range. We supply our chemical product 5-Aminotetrazole. Because of its widespread custom/contract services activities, RCI can offer customers access to its extensive network of worldwide suppliers. 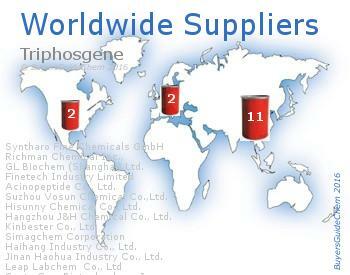 Richman Chemical Inc., is supplier for Triphosgene. Your partner in China for chemicals business. We are supplier of (R)-(-)-1,2-Propanediol. Expertize in supplies and sources of fine, specialty, pharmaceutical chemicals and intermediates. WE offer high quality products and JIT services with instant market intelligence in China, custom synthesis in our 3 production sites, famous principals as Brenntag, Univar,S inopec, Grace, Petrobras, DKSH, Formitex, Evonik, Merck, TCI, Sanofi, Chemo with creditable reputation and business cooperation. Simagchem Corporation is supplier for Triphosgene. Haihang Industry Co., Ltd.,is a leading producer and supplier of chemicals industry in china. By integrating people, technology and potential, we endeavor to make contribution to the betterment of human society. Haihang Industry Co., Ltd. is supplier for Triphosgene. We develop, produce and distribute high quality pharmaceutical chemicals, special chemicals and other fine chemicals. 1,1-di-tert-Butoxytrimethylamine will be also provided by us. Merck Schuchardt OHG, a 100% subsidiary of Merck KGaA, Germany, has, for the last 150 years, been one of the leading German producers and suppliers of organic intermediates, fine chemicals, reagents and solvents for laboratories, medium-sized and bulk production. Merck Schuchardt OHG also offers Terephthaloyl dichloride. INNOCHEM is an ISO 9001 certified company specialized in the worldwide marketing of chemical specialties for a wide range of industries. We supply our chemical product 2-Benzoylbenzoic acid methyl ester. From our offices in Belgium, France, Germany, the Netherlands and USA and through our network of contacts in the Far East we are serving our customers with high quality sourcing at competitive prices. Aakash Chemicals was founded in 1977 as a distributor of dyes for the global textile market. We provide Bromothymol Blue as well. Over the years Aakash Chemicals has continued to invest in its business to achieve record year on year growth, while constantly innovating into new product lines.